so, assuming an HTML environment, are there some default options that I can achieve using annotation or configuration? It would be great to be able to have this available and have it as an annotation option. I think there are too many variations for there to be 'typical ways'. So you'll always need to write a WidgetBuilder for this, setup to your own needs, rather than it being something offered by default. You could, of course, easily add support for custom annotations like you describe. See this example. 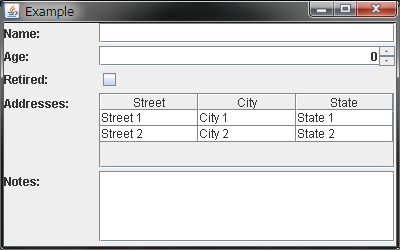 How can I get an Address object/ Address List coresponding to the selected row/selected rows in the addresses JTable? That's up to you. You're using the standard Swing APIs at that point, so this is not Metawidget-specific. Thanks for the pointer, it does work indeed. But more complicated, how would you go in nesting those lists? Apparently a ListTableModel like you described in your post would not be enough, or only good enough for the "last" levels of data (containing only simple data, but no list). It's important to remember Metawidget simply aims to automate what you would already have done manually. So there are many questions you must answer manually first, and this is one of them. I would suggest you take a look at JTree and its corresponding TreeModel. Or maybe something like this or this. Figure out how to write one of those to suit your purposes, then transplant that code into a WidgetBuilder as demonstrated in this blog.